Before you read any further, take a second to just forget everything you’ve learned about judging the quality of a t-shirt. 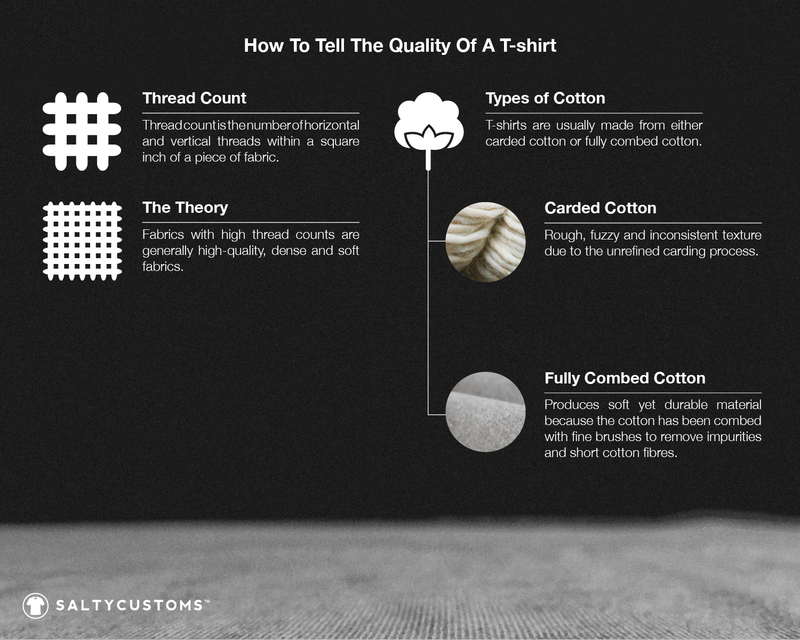 Gauging the true quality of a t-shirt is actually a lot simpler than you think, and there are just two things that you really need to know – thread count and cotton type. Thread count is a measure of the coarseness or fineness of a fabric by counting the number of threads contained in one square inch (length x width) of a fabric. The thread count theory is simple when it comes to t-shirts: the higher the thread count, the denser the fabric. The denser the fabric, the less space there is between the threads. And finally, when there is less space between the threads, the better your t-shirt is in holding its shape. A lot of times, we hear people saying that the thicker a t-shirt is, the better the quality. This notion is nothing more than a common misconception, as thick fabrics simply mean that they were knitted with heavier and thicker yarns. 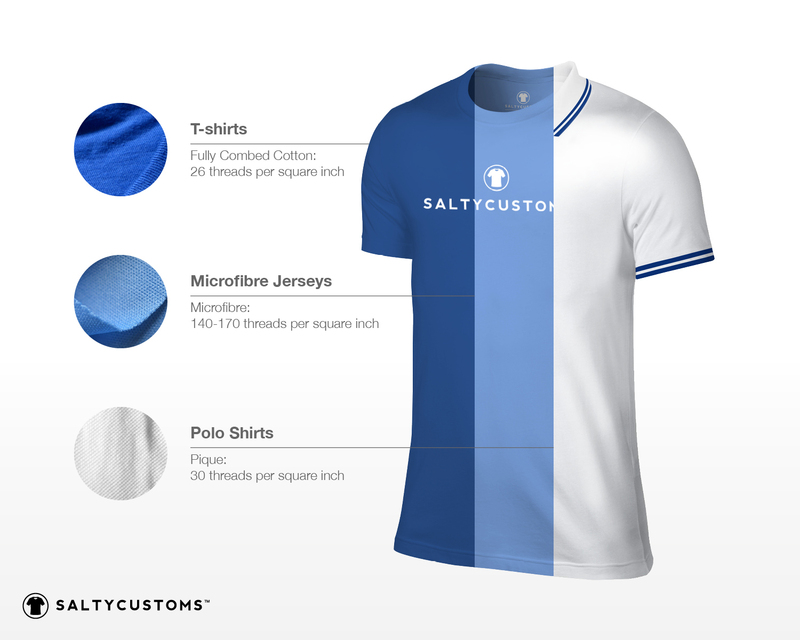 At Saltycustoms, all our products are specifically manufactured to meet the industry’s standards for high-quality apparel. The second criterion that determines the quality of a t-shirt is the type of cotton used. The two most common types of cottons are carded cotton and fully combed cotton. Carded cotton comes from cotton that has been harvested to make conventional cotton wool or thread, and then cleaned to remove dirts and seeds before finally being carded. The carding process separates the fibres and roughly lines them up so that they all lie in the same direction. Because the carding process is not refined, carded cotton is very rough and inconsistent in texture. On the flipside, fully combed cotton is an extremely soft version of cotton that is made by specially combing the cotton with fine brushes to remove impurities and short cotton fibres before they are spun into yarn. Because fully combed cotton is free of short threads that stick out, dirt and impurities, it is a lot softer than carded cotton. Fully combed cotton is also stronger because the shorter and breakable fibres have been removed through the combing process. At Saltycustoms, we preserve the quality of our apparels by using only fully combed cotton to produce our t-shirts. And because our t-shirts are made in our own state-of-the-art manufacturing plant, we are able to offer fully combed cotton t-shirts at competitive price points. If you would like to learn more about the quality of t-shirts, feel free to get in touch with our Apparel Consultants by emailing sales@saltycustoms.com or drop us a message at facebook.com/saltycustoms.